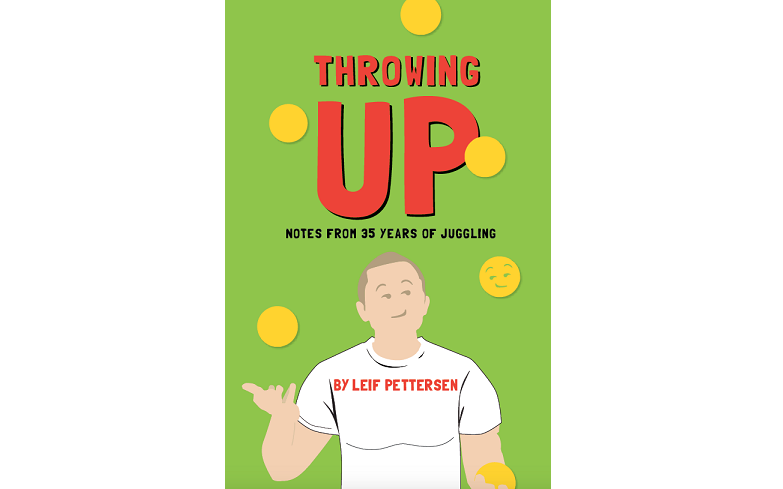 Throwing Up is a “semi-autobiographical” book based on the author’s life and understanding of Juggling and its various assets such as “sport, art, and act of juggling.” The author, Leif Pettersen, taught himself to juggle in 1982, attempted a performance career in the 1990’s, and at the age of 44 revisited juggling as a performer and competitive juggler. Leif has written this book with the sincerest goal of sharing his love and passion of juggling with the reader. He shares amusing anecdotes and interesting facts one collects over a veritable lifetime in an activity. As juggling develops with historians discovering new information daily, philosophers deepening our understanding of the definition of juggling, and artists exploring the capacity of the expressive natures latent within the art form, here we find an account of a practitioner taking the time to evaluate their own experience of juggling as a fundamental part of their lives. Leif Pettersen’s experiences in this book are shared with a strong personality and reads as though you are listening to someone share their life story over a cider at the local bar. He describes his experiences through learning how to juggle, his dissatisfaction with a career of performing, his life during a hiatus from juggling, an in-depth opinion/criticism of “why juggling is more exciting than all the sports,” and his return to juggling as part of his life. The book begins with a glossary of personal terms the author has come to use to communicate juggling. We move into an introduction that includes the strongest part of the book which is a description of a trick that Leif and his passing partner, Steve, perform in their act with visual and specific descriptions of the actions involved with an estimated amount of time it takes for that trick to be executed. The chapters follow suit and begin to reveal the inner conflicts of the author’s opinions on juggling (quickly negated by semi-comedic footnotes contradicting a statement made or revealing self/pointed deprecations.) We are taken on a masculine-point-of-view journey as an awkward, uncoordinated youth discovers value, confidence, and ego. Then, we read as he develops into a semi-popular high schooler with the ability to make money through juggling after being inspired by local and national professional jugglers. The next few chapters attempt to persuade the reader that juggling is more difficult and complex than any other sport. The author explores personal observations, books, and various research attempting to support the opinion as well as explaining the psychological advantages of learning how to juggle. Landing on the penultimate chapter we find the heart of the book: a man becomes a “competitive athlete” at the age of forty-four. We read the story of a passion being reignited and fueled with aches and pains from rigorous training as a team with an unlikely competition routine wins silver at International Jugglers Association annual competition. The relationship between Leif and his passing partner Steve is certainly deep. Unfortunately the author does not go deeper. Throwing Up sets out to “…finally beam a light on the aspects of this singular sport and lifestyle that almost never get highlighted…” With a community such as juggling, it is important to know who we are, what we are doing, and where we are coming from with the hopes that we can support our art form as it matures. Leif’s ability to be vulnerable and open about his own life is admirable and is certain to provide insight, wisdom, and warnings to a curious reader. Or, at the very least, inspire us to pick up some props and start juggling.